The Recollection arose from a manner of understanding the Augustinian way of life, the roots of which are embedded in the Tridentine reform and in the desire to live a more perfect life. Between 1540 and 1588 there began to emanate among Spanish Augustinians the ambition to implement in their Order the ideals that were transforming the spiritual and institutional structure of others. The first Missionaries to Mexico and Tomé de Jesús were their first representatives. 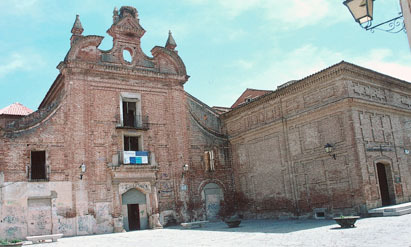 First Recollect convent, Talavera de la Reina, Toledo. Primer convento recoleto First Recollect convent, Talavera de la Reina, Toledo. On the 20th September 1589 the Provincial council approved their “Forma de Vivir” (Way of life). Edited by Frater Luis de León, it consists of 14 chapters which are concentrated on: the spirit of prayer, the equality which must reign among all the Religious and asceticism. One month later, on the 19th of October, the first Recollect community established itself in the convent of Talavera de la Reina. It consisted of eight Religious, lead by Francisco Briones and José de la Parada. Their life was poor, austere and totally directed towards God. The good harmony among the Calzados (i.e. unreformed/unrecollected Friars) and the Discalced Friars facilitated the immediate foundation of two new convents in the Valladolid towns of El Portollo (May 1590) and Nava del Rey (June 1591). Understandable tensions with the Superiors of the Province slowed the progression of the Recollects; but didn’t manage to halt them. In 1596 they established themselves in Madrid, where they wasted no time in constructing their Central See. In 1600 they did likewise in Toboso. Two years later Rome transformed the five convents into one Province dedicated to St. Augustine. The backing of Rome refuelled the Recollects hopes. With the support of the faithful they strengthened their presence in Castille and began to take an interest in other regions of Spain. Year after year new convents arose in Aragón, Castille, Cataluña, Extremadura, Valencia, La Mancha and Andalucia. In 1619 they established themselves in Rome. Simultaneously they organised the Novitiate while their own particular studies and ideals crossed the oceans. In the year 1604, the American Recollects' ‘advance guard’ broke ground for the first time in the proximity of the Colombian hermitage La Candelaria. By the following year the Spaniards had pooled themselves together with the missionary vanguard of the Church, setting sail for the far off lands of the Philippine islands.